Many, perhaps most, of the aviation cadets took their first ever flight in an airplane at Douglas. 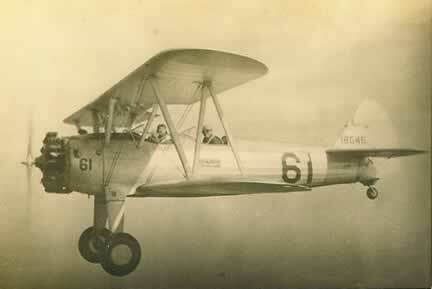 The airplane they flew in and learned to fly was officially the model 75. Equipped with various engines it was known by many names. 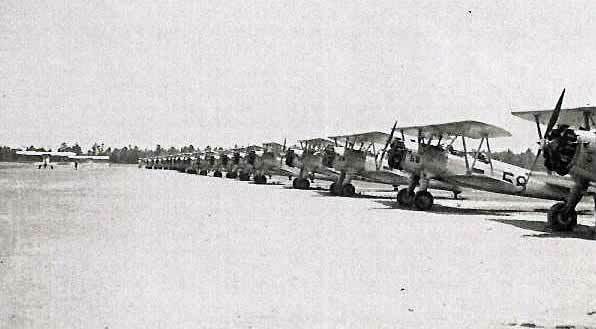 To the Army it was the PT-17, to the Navy the N2S, others called it the Kaydet as well as other designations. 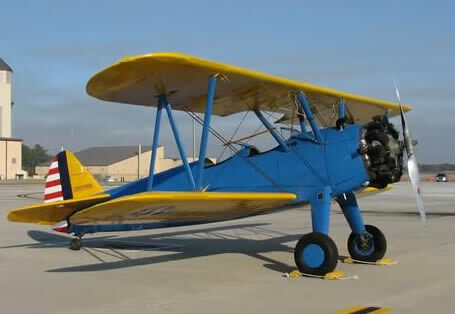 Today, 70 years later, this open cockpit biplane is known as the Stearman. Despite Boeing having bought the Stearman Airplane Company and building the aircraft, this classic biplane is universally called a Stearman. The Stearman is large, standing 9 feet 8 inches tall. The wingspan is over 32 feet and it is almost 25 feet long. The 220 hp engine allows the airplane to be powerful enough for safety but slow enough to allow the student pilot to get himself out of trouble when necessary. It is the perfect primary trainer. Wing Span: 32 ft, 2 in. Height: 9 ft. 8 in. For a view of the cockpits, click here. In 1941,the young aviation cadets had spent their lives in the Golden Age of Aviation. 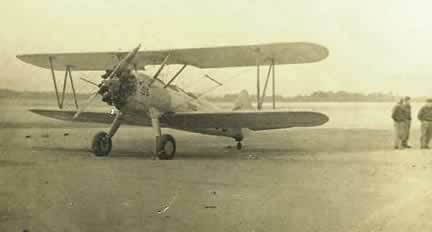 Just 14 years earlier Lindbergh had flown the Atlantic. That audacious feat catapulted Lindbergh, and pilots in general, as well as aviation into the highest realms of fantasy, glory and heroism. The public became fascinated with aerial exploits of distance, air races, flights of discovery and perceived gallantry. Everyone knew of Amelia Earhart, Richard Byrd, Wiley Post and Douglas “Wrong Way” Corrigan. Flying was glamorous, exciting and dangerous: a combination to attract many a young man. Shortly after their arrival at Douglas each young man would be taken up for his first orientation flight by the flight instructor. Some had never even seen an airplane up close before. It was something they had dreamed about, perhaps for years, and it was an experience they would never forget. This is one man’s story. Each of us cadets is given a parachute. After putting on the backpack-like straps and clipping the straps across the chest and between the legs the ‘chute hangs low behind banging into the backs of my legs as we walked out to the row of Stearman on the flight line. Putting on the parachute and being shown the D ring to pull after leaping clear of the aircraft was a stark reminder that aviation was not all glamour. The danger of accidents, injury and death was real. I couldn’t help thinking that maybe this whole idea may be a big mistake. As I approached the Stearman for the first time I tried to take in the whole plane. It’s big. Much bigger than I thought. The fuselage, painted bright blue is aluminum but the wings, the big yellow wings, are fabric. I can’t help but notice the Air Corps roundel on the wings. The Blue circle with the white five pointed star with the red center. This is the military and I am part of it. It is very awkward, with the parachute hanging down behind my knees, to take the big step to get up onto the lower wing. I really wish there was a small stool there but that just wouldn’t be right. I wanted to hop up onto the wing as if I did it all the time but feared I’d trip myself. Once up I step over the side onto the seat of the cockpit before settling down inside. I sit on the parachute. It’s just a seat cushion now. I watch as the instructor turns on the fuel. I have a hose about an inch in diameter from my ears that leads to the instructor. He can talk to me but I cannot speak to him. He tells me what he’s doing as he does it. He sets the fuel mixture to rich. Then the magneto switch to indicate both on. We’re ready to start the engine. I look to the side and see the four other guys, wearing their parachutes, standing there watching me. They’ll fly after I get back. This is so exciting I can hardly believe it’s happening. I see a ground crewman who appears to be a cadet standing by the left wheel right behind the propeller who starts to turn a big crank in the side of the engine. I know this crank winds up a heavy flywheel on the inertial starter. When the starter is at screaming pitch, the man now panting on the crank pulls out a lever to engage the engine and spin the prop. The engine now comes to life. The engine blows back a bit of exhaust smoke then steadies to an idle. It’s noisy. The plane is shaking. The instructor advances the throttle on the left side of the cockpit – the throttle in my cockpit moves along with his. All of his controls are duplicated in my cockpit. As the throttle moves forward the noise increases and we start to move. Due to the low tail wheel the aircraft sits at a high angle, blocking my view ahead. I see only sky through the whirling propeller. The pilot makes S-turns to allow us to look from each side as we turn so we can see what is straight ahead. We get to the end of the field. The instructor tells me that he’s pressing the brakes and will run up the engine. The plane shudders as the engine runs up to full power for a few seconds. He switches from one magneto to the other to make sure they both work. He throttles back to idle. I think we’re ready to go. The instructor tells me to put my feet on the rudder pedals and my right hand lightly on the stick so I can feel what he’s doing. Once we’re in the air he’ll let me take over control and will just tell me what to do. I hear the instructor say, “You ready ?” I nod my head and answer “yes, Sir” even though he can’t hear me. This is it! We turn and face into the wind across the big field of grass, dirt and sand. The throttle goes forward and we start accelerating forward surprisingly fast. The tail comes up almost immediately and now I can see ahead of us. The flight line and control tower rushes past. We charge across the ground. We must be going 60 miles per hour, maybe 70 or more. We bump along the grass for a few more seconds. I think we cover only about 500 feet when suddenly the roughness stops. I glance over the side. The grass is rushing by 10, 15, 25, 50 feet below! We’re flying! It suddenly occurs to me that I’ll never, not ever, forget this moment. I see the trees at the end of the field coming closer but from the rate we’re climbing we’ll go over them easily. Now, there’s just sky in front of me. The horizon is well below the nose. When we get up pretty high the instructor tells me that I’m in control and that he’ll tell me what to do. He tells me to move the stick with more “pressure” than motion right and left and forward and back to get the feel of the controls. Then he tells me to move the rudder with my feet, right then left. We are to make some gentle turns. Left turns are simple. Just pressure the stick a bit to the left. The left wing drops into a bank and the plane starts to turn left. With the engine turning the airplane tends to turn left so the rudder wasn’t even necessary. When I come back to level I use a little opposite pressure on the stick and a little push on the rudder pedal. To go to the right requires the stick to be moved a bit to the right and right rudder applied for a coordinated turn. After turning right and left a few times it was easy. The instructor tells me that I can determine a 45 degree bank instantly as one of the bracing wires is at a 45 degree angle so when I lay that wire flat on the horizon I’ll be at 45 degrees. That’s a neat little trick only us pilots know. After a few turns I have the feel. I can fly! My instructor tells me that we’re going to do a power off stall. Uh oh! I’ve heard about stalls. The idea is you cut the power, put the nose up so the airplane stops in the air. Then, it falls because there is no air going over the wings to keep it up. Frankly, I’m scared. I know I don’t like the feeling of falling. Up until now I hadn’t even looked at the ground – only at the horizon to keep me orientated. The ground looks far away. The instructor tells me to reduce the throttle almost to idle and to pull the nose up. He says I should listen to the sound of the engine and also for a high pitched sound of the wind in the wires. I am more interested in that big drop than the sound of the engine. I throttle back and pull back on the stick. The noise of the engine drops and there is a high pitched noise. “Hear it? Hear it? That’s the wind in the wires. Remember that sound” says the instructor. “Back more on the stick” says the instructor. I pull it almost into my stomach. The nose goes up instantly. All I can see is sky. A quick glance to the side shows the horizon way, way down behind me. I also smell something….it smells like exhaust. In less time than it takes to tell it I feel the stick go limp then the nose drops! To my great relief the nose drops slowly and gently. I don’t feel like I’m falling….I’m just flying straight down, but it isn’t scary at all. “Pull back on the stick and open the throttle.” “Back a bit more.” “A bit more, bring it back level on the horizon.” I have survived a stall. It wasn’t bad, in fact it was easy. I could do that again, no sweat. Too soon it is time to land. I’m lost. I have no idea where the air field is. The instructor directs me back. Ah! There it is. Can’t miss it now. The big field, the row of airplanes on the flight line. The oval road with the barracks and other buildings around it. It’s easy to see. As we get near the ground the instructor takes over. At 2 or 3 feet above the ground the instructor pulls the stick back into his stomach, and mine. The nose points up in the air, the pitch of the wind in the wires changes then stops. At this slow speed the airplane stalls but the ground is so close there isn’t room for the nose to drop as it did high in the sky. The Stearman simply drops gently to the ground with the 2 main wheels and the tail wheel contacting the ground at the same time. We don’t even bounce. A perfect 3 point landing. As we slow down I’m told to S-turn my way back to the flight line so another cadet can take a turn in the sky. The instructor shuts down the engine and the big propeller comes to a stop. I am bursting with excitement and pride. Not only did I fly but it was easy. Or, maybe I’m just naturally good. Heck, I’ve flown an airplane. I guess I’m a pilot now just like Lindbergh and Byrd.